Real-life husband and wife Stefan Cohen and Jodi Beckwith play Mr. and Mrs. Abramowitz in the JCC CenterStage production of "Coney Island Christmas." Their daughter, Tali Beckwith-Cohen, is also in the production as Shirley Abramowitz. Thursdays at 7 p.m.; Saturdays at 2 p.m. and 8 p.m.; Sundays at 2 p.m. When a "Christmas" play is presented at a Jewish Community Center the weekend before Hanukkah begins, it's going to cause some head scratching. But for those who know that "Coney Island Christmas" is based on a short story by Jewish writer and activist Grace Paley, it makes a little bit more sense. Paley's work focused on everyday life -- the mundane human interactions that cloak a treasure of truth or a divine learning experience. In 1978, she told The New York Times, "I'm not writing a history of famous people. I am interested in a history of everyday life." The Jewish Community Center's CenterStage has a history of presenting a surprising, virtually unknown holiday show each year, and it's delightful to see what production artistic director Ralph Meranto chooses. He's well known for selecting new works, and "Coney Island Christmas" is no different. This is the show's East Coast premiere (it opened in 2012 as a commission for the Geffen Playhouse in Los Angeles). Pulitzer Prize-winning playwright Donald Margulies ("Dinner with Friends") takes Paley's short story about a Jewish girl who is cast as Jesus in her school's Christmas pageant and crafts a heartwarming tale that hits all the right notes for the holidays: family, finding joy, and of course, tradition. "Coney Island Christmas" begins in modern-day California, but spends much of the plot on a story set in 1930's Coney Island, a veritable melting pot where young Shirley Abramowitz lives with her shopkeeper parents in a three-room apartment. 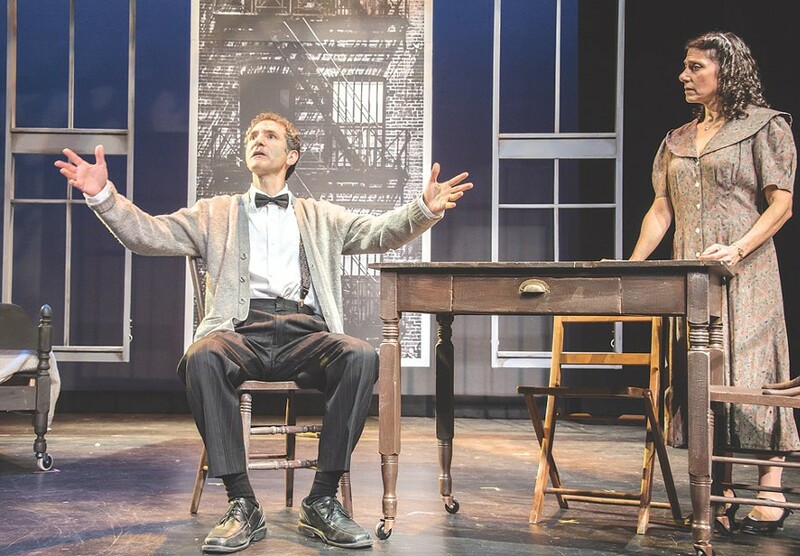 To inspire that time period, scenic designer Eric Williamson created a gorgeous tableau of enlarged black and white photos that fly down from the rafters of the stage. The photos are enhanced by pieces of furniture and props, but they provide quick transportation back to the Cyclone roller coaster, boardwalk, and Nathan's hot dogs (as several audience members remarked out loud throughout the show). The costume design by Heather Fox rounds out the nostalgic feel with giant hair bows, knickers, and boxy wool coats. Director David Henderson skillfully guides the cast -- most of whom are under the age of 18 -- through a plot that, for better or worse, shows the similarities between today's world and 1930's Coney Island. Here, too, is racial tension, and a hesitation to learn about the story of another culture. Of course, none of this would work at all if the cast members weren't talented. In a post-show talkback on Sunday, Meranto and Henderson discussed how they lowered the ages of the youth ensemble to between 10-13 years old, whereas the West Coast premiere featured older teenagers. The young middle school students in this production are still baby-faced and just a bit awkward -- it's absolutely charming. This is an ensemble cast that truly shines, from the smallest role to the largest. One particularly fun dynamic is that of the lead character, young Shirley Abramowitz (Tali Beckwith-Cohen), and her onstage parents, who also happen to be her real-life parents (Jodi Beckwith and Stefan Cohen). Tali is a true typecast for Abramowitz's character. Her energy informs her peers throughout the show, and she impressively carries dialogue and emotion -- she's one to watch as she continues to perform. The other youngsters in the show have their own shining moments, and many are laugh-out-loud funny, especially during the "pageants" that take place in the play. The adult ensemble is also strong, led by Stefan Cohen (Mr. Abramowitz), who hides a razor-sharp wit beneath his gentleness. And audiences at the JCC will recognize Jodi Beckwith from her many local roles. Here, Beckwith expertly plays a strict Jewish mother: lots of vinegar, with a little sugar just before she makes things too sour. Davida Bloom, who plays adult Shirley, is unrecognizable in her grey wig and aged makeup, but perfect in the wise narrator role. (Her character voices throughout the show are a hoot as well.) Rounding out the adult ensemble are Nancy Berg (Miss Glacé) and Gary "Turk" Thomas (Mr. Hilton), who have an adorable chemistry with both the youth ensemble and one another. The show runs approximately 90 minutes with no intermission, and it's a sugary treat from start to finish, but there's still a few lessons tucked away within the glitter. And if a community theater has one primary role, it is to stay true to its name by bringing together the community. "Coney Island Christmas" does that beautifully, melding actors of all ages, holiday spirit, nostalgia and cultural differences.